What Muscles Are Worked by the Most Effective Shoulder Exercises? 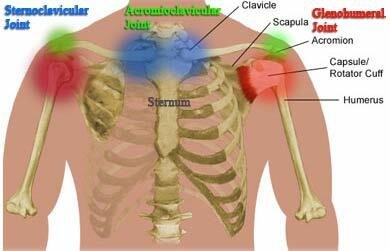 There are many muscles which act at the shoulder joint. Multi-joint exercises for the chest and back involve the shoulders to some extent. Most of these effective shoulder exercises attempt to isolate the primary muscles of the shoulder complex rather than use the synergist (helper) muscles. The synergist muscles will always be somewhat active during multi-joint exercises, but these shoulder exercises are going to minimize their role. This will help you effectively target and build your shoulder muscles so your shoulders will look more aesthetically pleasing. In addition to the bodybuilding affect, most of these effective shoulder exercises will build functional strength. With functionally strong shoulders, you will increase your sports performance while minimizing the chances of any injuries during other exercises. CLICK HERE to Jump Down to the Shoulder Exercise Videos or continue reading to learn more. The primary action of the medial (also known as lateral) deltoid is to abduct your arm. Abduction is the motion of raising your arm up to the side. An example would be the upward motion of your arms during jumping jacks. The medial deltoids are often targeted during shoulder exercises aimed at building the shoulders’ aesthetic appeal. The medial deltoid is the muscle which shows from the front and back and continues down the side of your arm, giving the shoulders a full, round look. If you look to build your shoulders, the medial deltoids will get the least work during exercises for other body parts. This means that it should be a priority to isolate the medial deltoids during the most effective shoulder exercises. This is because the front and rear deltoids work a lot during other exercises. The medial deltoid may be difficult for you to isolate during shoulder exercises. In order to isolate the medial deltoids, form is crucial. The anterior deltoid is the front of your shoulder. The primary motion performed by the anterior deltoid is shoulder flexion. Shoulder flexion is when you raise your arm straight up in the front. The anterior deltoids are very active during all pushing exercises such as bench pressing and push-ups. Because of this, you do not need to perform many shoulder exercises which isolate the anterior deltoids. Click here to learn all about chest exercises. It is very easy for the anterior deltoids to compensate for the medial deltoids if you use incorrect shoulder exercise form. The most effective shoulder exercises stress form, as quality is almost always more important than quantity with regard to sets and reps. The primary action of the posterior deltoids is transverse abduction, which is bringing the arms toward your back from shoulder level. An example would be the motion of taking your hands off the keyboard, lifting them to shoulder level, and bringing them out to the side of your body. The posterior deltoids are very active during back exercises. Most effective shoulder exercises concentrate on the medial deltoids. Like the anterior deltoids, the posterior deltoids do not need to be isolated with shoulder exercises very often. The trapezius or “traps” is the muscle at the top of your shoulders and the base of your neck which continues down the middle of your upper back. The middle and lower fibers are considered your upper back, so exercises which use the lower parts of the trapezius are covered in back exercises. 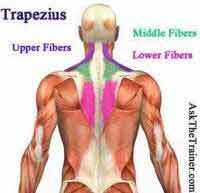 The upper fibers of the traps are considered your upper shoulders. The upper traps’ primary motion is scapular elevation, or shrugging your shoulders. As previously mentioned, the most effective shoulder exercises primarily target the medial deltoid, so the most effective shoulder exercises for your traps are on their own page. When you think of the shoulder joint you probably think of the ball and socket like you see on skeletal models. The shoulders are more complex than that. To really know the most effective shoulder exercises, you should understand the basic structure of the shoulder joints. Connects the inner part of the clavicle (collar bone) to the sternum. Connects the outer part of the clavicle (collar bone) to the acromion process, which is the bump at the top of your shoulder. This is the ball and socket we all think about when talking about the shoulders. It is called the glenohumeral joint because socket is called the glenoid fossa and the ball is the head of the humerus. There is no need to go into the finer details of shoulder joint anatomy. It is just important for you to know that effective shoulder exercises stress the three different joints, not just the glenohumeral joint. The three joints of the shoulder complex are what allow the the shoulders to have such a large range of motion compared to other joints. This is because the structure of the shoulder joint allows for movement in many different planes of motion. What About the Rotator Cuff? Unfortunately, when you hear about the rotator cuff, it is usually about an injury. The rotator cuff is very susceptible to injuries because it is made up of small muscles: the supraspinatus, infraspinatus, subscapularis, and teres minor. The rotator cuff muscles have various functions. The most important function of the rotator cuff is to decelerate arm motion. This is why rotator cuff injuries are common in baseball pitchers. Baseball pitchers throw their arms forward at very high speeds. The rotator cuff is what slows their arm down after the pitch is thrown. Improper pitching form, such as bad follow through, can lead to a torn rotator cuff. The tear happens when the forces are too great for the small muscles of the rotator cuff to properly decelerate. Just think, the rotator cuff muscles can tear just from decelerating the motion of your arm weight. What do you think would happen if you try to decelerate a heavy dumbbell which is traveling fast? This is why proper form is very important for the most effective shoulder exercises. Since a strong rotator cuff is essential to shoulder strength and stability, you can find more rotator cuff information and exercises on our rotator cuff exercises page. NOTE: When performing each shoulder exercise, it is very important that you lower the weights under complete control. The lowering part of all lifts is called the eccentric phase. During the eccentric phase, muscles are lengthening under resistance. As previously mentioned, muscles in your shoulder and your rotator cuff will be subject to extreme forces if you do not perform each shoulder exercise with correct form. For any shoulder exercise to be effective, form must be correct and the weights must be under control. 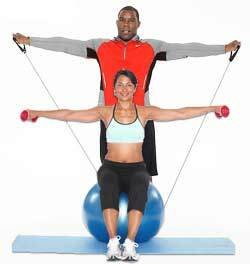 This will allow you to work the right shoulder muscles and reduce the risk of injury. The standing iso-lateral (one side at a time) dumbbell shoulder press could be the best shoulder exercise. Many people are limited by one side which is stronger than the other. If you use the iso-lateral dumbbell shoulder press as your primary shoulder exercise, you will find out if both your arms and shoulders are the same strength. You will also get a tremendous workout for your core. Start: Stand in front of a mirror with your feet together, touching each other. On your non dominant side, hold a dumbbell up to 90 degrees out to your side. Your palms should face forward. Keep your hips and shoulders completely 100% level for the duration of the movement. Contract your glutes, and draw in your core for the duration of this movement. Begin the motion: Push the dumbbell straight up to the ceiling. In the finishing position, the dumbbell should be slightly outside your shoulder. Lower the dumbbell back to the original position. In order for this to be one of the most effective shoulder exercises, you must have your shoulders completely level for the entire set. If you cannot keep your shoulders level, you should use a lighter weight. If you do not feel engagement in your core, your form is incorrect. Modifications: If the iso-lateral dumbbell shoulder press is not tough enough for you, you can stand on an unstable surface such as a BOSU ball. The standing military press or barbell shoulder press has long been considered one of the most effective shoulder exercises. Your core stabilization and total-body stabilization will be used for the standing military press. Military presses don’t isolate the medial deltoids, but they allow you to use a significant load (weight) that works the majority of your shoulder muscles as well as the upper chest. Start: From a standing position, approach a barbell racked slightly below shoulder level. Grab the barbell and unrack it with your palms facing away from your body. Your grip should be wider than shoulder width, but no wider than the distance from your shoulder to your elbow out to the side. Begin the motion: Take a deep breath and push the weight upwards. The weight should never be very far away from your body. As you push the weight up to the finishing position, the bar should be right above the top of your head. Modifications: You can also perform the military press from a seated position. The same rules apply. Do not let your back arch which means you lose core stabilization and your lower back is at risk. Your arms can be fully extended at the top or slightly bent. If you fully extend your arms, you will actually use the trapezius and triceps a little more. If you are trying to isolate your deltoids, it is best to stop the ascent before you fully extend your arms, which will cause you to elevate your shoulders and work the trapezius. It is very important that you keep your glutes contracted tightly and your core drawn in during the military press. If you do not do these two things, you will not only put your lower back at risk, but you will exercise the wrong muscles, possibly leading to muscle imbalances and posture problems. The dumbbell shoulder press could be the most effective shoulder exercise. Since your head will never be in close proximity to the weights, you can have more medial deltoid involvement than the military press provides. Start: Set up a bench to where the back is around 90 degrees or slightly less. Hold the dumbbells on your thighs toward your knees. Slowly lift one knee at a time with the dumbbell on them up to your arms. Keep your elbows in while you grab the dumbbells and bring your arms out to the side of your body to a 90 degree angle. The dumbbells should be in line with your ears on either side of you. Keep your core drawn in toward the back of the bench for the duration of this effective shoulder exercise. Begin the motion: Push the weights up in the air. The natural motion of the dumbbells will bring them in slightly toward your head. As the dumbbells approach the area right above your shoulders, slowly lower them back to the original position and repeat. Modifications: To increase the difficulty, you can perform the dumbbell shoulder press from a standing position, on a stability ball, balanced on one foot or any other way which will challenge stabilization. If you bring the dumbbells all the way together at the top of the motion, the trapezius will take work away from the deltoids. It is best to lower the dumbbells before reaching this position if you are trying to use this as a shoulder isolation exercise. It will probably not come as a surprise that the Arnold press is named after famous bodybuilder/actor turned politician Arnold Schwarzenegger. What makes the Arnold press one of the most effective shoulder exercises is the Arnold press works in all 3 planes of motion, the transverse, frontal and sagittal planes. Start: Begin with half of the weight you would use for the dumbbell shoulder press. Bring the dumbbells up to a position right in front of your shoulders and close to your body. Your palms should face towards you. Begin the motion: Rotate your arms out to the side. As you begin the rotation, slowly begin to push the dumbbells toward the ceiling. When you reach the top the dumbbells should touch. Your palms should face away from your body. While the dumbbells are directly above your head, rotate your arms around all the way until your palms face you. Then slowly lower the dumbbells back to the exact original position. Modifications: There are many different ways to perform the Arnold press. Make sure you use strict form and lower the weights under total control. The dumbbells should be very close to your body for the duration of the movement. There are many ways to perform the Arnold press. This version is a great way to safely and dynamically work all the shoulder muscles in multiple planes of motion. Dumbbell lateral raises are an exercise 95% of the people in the gym perform incorrectly. They are the most effective shoulder exercise to isolate the medial deltoids. If performed improperly, the anterior deltoids get most of the work. Start: Use a light pair of dumbbells. Position the dumbbells at your side. Keep a very slightly bend in your arm. Begin the motion: Rotate your arms ever-so-slightly internally. To keep the medial deltoid under tension, maintain this internal rotation of the humerus at this exact position for the entire duration of the movement. Raise your arms laterally (to the side) until the dumbbells are at shoulder level. When your arms are at shoulder level, the crease in your elbow should be directly up and down. Modifications: You can perform lateral raises with resistance tubes, bungee cords, cables, cans of beans, or whatever resistance you want. Just make sure you maintain the correct form to isolate your medial deltoids. Which Shoulder Exercises Are Most Effective? First and foremost, the most important aspect of any shoulder exercise is safety. The shoulders are most mobile yet the least stable joint in the body. The shoulders are prone to traumatic injuries as well as overuse injuries due to the cumulative injury cycle. A shoulder injury makes it very difficult for you to do any upper body weight training. Sometimes shoulder injuries even make it difficult to do leg exercises. Any shoulders exercise risks injury if you perform it improperly. The key most effective shoulder exercises is the use of good form and proper tempo. The most effective shoulder exercises have less risk for injury and attempt to isolate the medial deltoid, which gets less work with chest and back exercises. When Should You Do the Most Effective Shoulder Exercises? Your shoulders are under stress during most upper body exercises. Since your shoulders have so much to do with chest exercises and back exercises, it is best to do the most effective shoulder exercises after a day of rest. You should never do a shoulder workout the day before or after your chest workout. You can do your shoulder exercises as part of a chest or back workout, but let them recover with a day of complete rest for your upper body for proper shoulder development and less chance of injury. If you are looking for more than effective shoulder exercises and want to increase strength or build your trapezius muscles, you may want to use some more advanced shoulder exercise techniques. If your sport or job requires strong shoulders, these effective shoulder exercises focus on increasing your strength. Shoulder strengthening exercises also focus on stability and a strong rotator cuff. The best shoulder exercises for strengthening your shoulders and rotator cuff are not the same as the most effective shoulder exercises for building the shoulder muscles. Some consider the trapezius muscle to be the icing on the cake. No matter what shirt you are wearing, big muscular traps always crown a weight lifter’s physique. The best shoulder exercises for the trapezius are very different from the exercises which isolate the deltoids. Here are three simple yet effective shoulder exercises that you can perform to help avoid common injuries to your shoulders.